Today I had an exciting opportunity to present alongside Dan Musser III, owner of Grand Hotel on Mackinac Island in Michigan, who was in town for a power networking workshop at Berea High School in Berea, Ohio, followed by “From Grand to Grand,” a tea luncheon at the Grand Pacific Hotel in Olmsted Falls. Following my presentation on Mackinac Island tourism, Mr. Musser told the story of Grand Hotel and how his family has been associated with the summer resort since 1919. Grand Hotel, which opened in 1887, elevated the stature of Mackinac Island, making it the preeminent Great Lakes summer resort. Built in an astounding 93 days by crews working three shifts around the clock, the white-pine hotel became distinguished for its 626-foot-long porch (now 660 feet). At that time, Mackinac, as detailed in Steve Brisson’s essay in American Tourism, was the nation’s second oldest national park (designated as such from 1875 to 1895, when it became the nation’s first state park). Though unaffiliated with the park and an built in a style more akin to Grand Union Hotel in Saratoga Springs than Old Faithful Inn in Yellowstone, Grand Hotel shared something in common with western national park lodges: both were the products of transportation companies tapping the market for scenic wonders. This season marks Grand Hotel’s 125th anniversary. It has outlasted all but a handful of the many hundreds of Victorian summer hotels that once graced seashores, mountain springs, and lake bluffs. 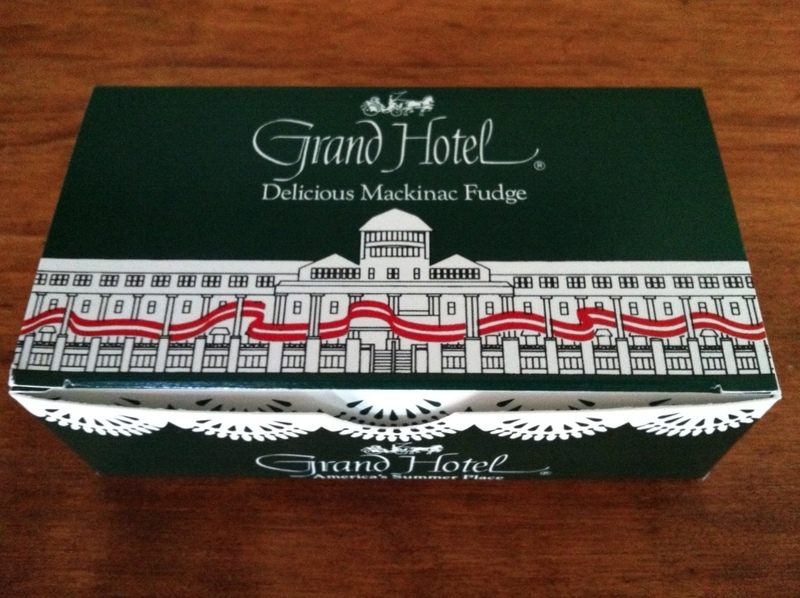 Mr. Musser’s visit left a lasting impression of a singular resort destination – and the little boxes of Mackinac’s trademark fudge whetted many an appetite for a summer vacation. I like staying in historic hotels. This one is well worth it – truly an enchanting place. It’s easy to see why the rich used to stay all season. I could use a whole season at a nice place like this. I am so glad this hotel has stood the test of time, there is something soothing about this type of architecture. For, while I am fully aware there were no “good old days” this seems to suggest they might have been possible.